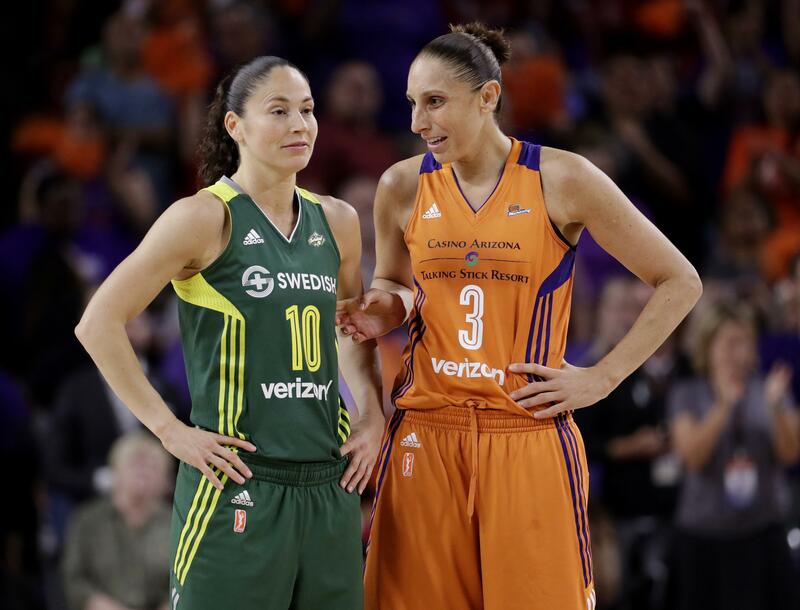 ➤Sunday, Aug. 26: Phoenix at Seattle, 2 p.m.
Tuesday, Aug. 28: Phoenix at Seattle, 7 p.m.
Friday, Aug. 31: Seattle at Phoenix, 7 p.m.
SEATTLE – Considering their long history together in the WNBA, Phoenix’s Diana Taurasi and Seattle’s Sue Bird have rarely clashed in the postseason. Eight total games across more than 14 seasons of both being in the league, seems a low number of times for two of the game’s great stars to meet in the postseason. How quick Seattle was able to return to being and elite franchise wasn’t a surprise for Bird, who has been with Seattle since 2002. But it wasn’t something she was counting on either. The reason Seattle was so good in the regular season was the play of Breanna Stewart. In her third pro season, Stewart averaged 21.8 points, 8.4 rebounds, shot 53 percent from the field and nearly 42 percent on 3-pointers. She was voted the AP’s player of the year. Phoenix getting to this point of the playoffs is a surprised after a midseason swoon. The Mercury went 2-11 over a 13-game stretch in July and early August. The Mercury closed the season with four straight wins and have won six straight overall with the two playoff wins. The teams met three times during the regular season, two coming in the first two games of the season back in May. Seattle took two of the three matchups, but only the last one gave the Storm an indication of the Mercury lineup they’ll see in the semifinals with Bonner at power forward. The two wins already in the playoffs have improved Taurasi’s career record to 13-0 in winner-take-all games in the WNBA postseason. Seven of those have come on the road, including Thursday’s win at Connecticut. “The impressive part is the amount of times. It’s not that she’s done it, although you can look at each individual performance and be wowed by it, it’s the amount of times she’s been in those positions and risen to the occasion every single time. That’s what is impressive,” Bird said. Published: Aug. 25, 2018, 12:28 p.m.